Roger Kool’s real name was Roger Kiew. He was a popular radio DJ in the 1970s to the 1990s. What was “kool” about Roger was his determination. You see, Roger was blind. When he was five, he developed eye cancer and lost his vision. Despite this, he wanted to become an outstanding radio DJ. He got his chance in the 1970s when he got a job at Rediffusion. Over time, he also worked in NTUC Radio Heart as well as in a radio station in Sri Lanka. He was very passionate about his job and he was a perfectionist. Roger used to practise by using a tape recorder and listening to his own voice over and over again. For his radio broadcast sessions he would arrive two hours early. 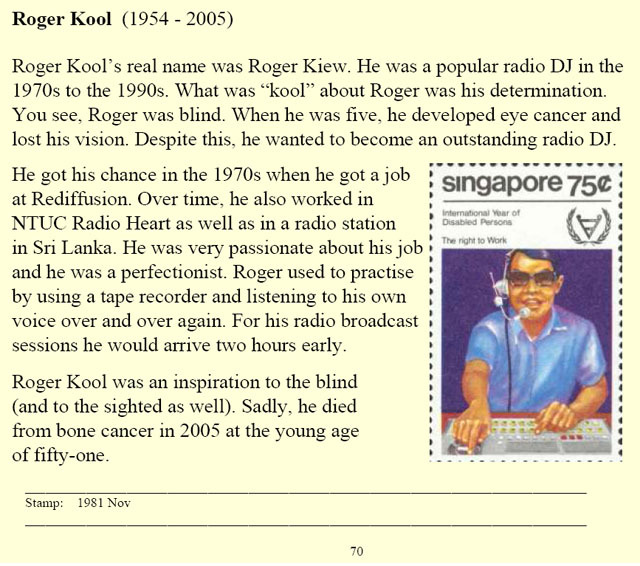 Roger Kool was an inspiration to the blind (and to the sighted as well). Sadly, he died from bone cancer in 2005 at the young age of fifty-one.